iBeacon in iOS 8 at WWDC? Where was it?? 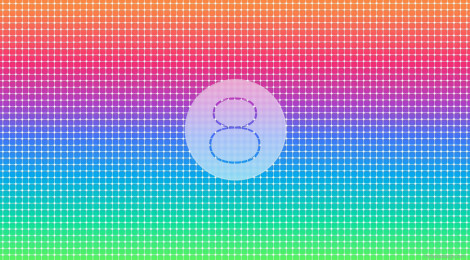 Where was iBeacon in Apple’s recent iOS 8 announcement at its annual Developer’s Conference? Many people following iBeacon had predicted a major announcement from Apple on its future plans for the technology, but were left a little disappointed by the lack of major mention. 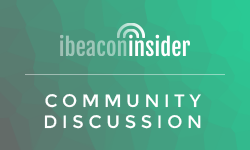 Although Apple didn’t hit us over the head with iBeacon news or its plans for the technology, there were some interesting pieces of information released that could relate to iBeacon’s future. According to some tests done by AppleInsider, Apple has included a new UI feature on the lock screen seemingly triggered by iBeacon. Opposite the camera access icon is a translucent Apple Store icon that appeared when near iBeacons at both an Apple Store and a Starbucks. Tapping on the icon apparently caused a device crash, but the presence of this mysterious icon could mean something new for iBeacon in iOS 8. As we did not have the Starbucks app installed on our iPhone, we assume the notification was attempting to lead us to the app’s download page. Unfortunately, the impromptu test’s results were inconclusive as the App Store was completely unresponsive at the time. If a beacon exists in the wild and there is no phone around to hear it, does it exist? App fragmentation has and will continue to be a major obstacle in the way of iBeacon reaching its full potential. As it stands right now, if a consumer doesn’t have the specific app that happens to “go” with their nearest iBeacon, nothing will happen. When the chief goal of iBeacon is contextual engagement at scale, this is a horrible result. Some clairvoyants have recognized this problem from the start, and numerous platform solutions coupled with SDK’s have cropped up to consolidate iBeacon reach across wide swaths of publishers. A change as subtle as a new icon on the lock screen shows that Apple recognizes the issue and will take steps to help solve it. It looks like this UI feature can do two things, depending on whether you have the “ibeaconified” app or not. If you have the app downloaded, tapping the icon seems to take you directly into the app without the fuss of “sliding to unlock”. This could do wonders for app engagement and will help make iBeacon interaction more friction-less, timely, and contextual. If you don’t have the app, it seems tapping the icon will take you directly to the app-store where you can download the app to join in on the iBeacon fun! This will help with the iBeacon “reach” problem and could also open some interesting doors for location based app-discovery. A More Granular “Opt-In” Feature? In iOS 7.1, Apple announced that apps would continue to monitor for iBeacons so long as they were installed on the phone. This new development was exciting for app developers because it meant it would be easier to engage users with iBeacon triggered pushes and features. Possibly recognizing the incredibly fragile line between utility and annoyance, Apple seems to have made the gradient of “Opt-in” more granular. iOS 8 users can now elect to allow location pushes “Never”, “While Using the App”, or “Always”. Giving users more control is always a good thing – and in the long term this subtle change by Apple is a great solution for staving off the “annoyance factor” and encouraging developers to stay loyal to marrying iBeacon and utility. I have been researching this and can not find anywhere a way to have suggested apps (that you dont already have) show up and go to the app store based on iBeacons. Do you know how this is done or if it is possible based on iBeacons? I am quite certain I’ll be informed plenty of new stuff right right here! It’s Julio here from Blue Sense Networks. I believe that apple should be even more granular than that. They should have 1 native Apple IOS app rule all proximity data and messages and allow developers to integrate their apps right from the Apple Store within that default IOS app without even having to be downloaded in the phone. Then the end user could do some basic filters on the IOS native proximity app like what industries they would like to receive proximity content from like food, fashion, services etc And that should solve the entire problem. Proximity data should be a different layer handled at an Apple IOS system app rather than at each of the third party apps.